Take part in our quiz about Christmas and you could win a Marks and Spencer festive hamper worth £75! Would you like to win a Marks and Spencer hamper worth £75? To take part in our quiz about Christmas simply email your answers to competition@cosyfeet.com by Sunday 18th December 2016. The winner will be picked at random from the correct entries. Good luck! 1. What is the name of the period leading up to Christmas? 2.	Who brings presents to children in Holland on 5th / 6th December? 3. What’s lucky to find in your Christmas pudding? 4. London's Trafalgar Square Christmas tree is traditionally given by which country? 5.	Who wrote ‘How the Grinch Stole Christmas’? 6. What is the name of the cake traditionally eaten in Italy at Christmas? 7. Which Christmas slogan was introduced by Clarissa Baldwin of Dogs Trust in 1978? 8. In the song 'The Twelve Days of Christmas', how many swans were a-swimming? 9. John Callcott Horsley designed what first commercial Christmas item in 1843? 10. What is the name of the animated Christmas film featuring Tom Hanks? To be in with the chance of winning a M&S festive hamper worth £75, simply answer the 10 questions in our Christmas quiz correctly. To enter the competition, email your answers to competition@cosyfeet.com by Sunday 18th December 2016. A winner will be selected at random from the correct entries. All competition entries will be added to our email mailing list. By submitting an entry into our competition you are consenting to us using your name on our website and in future newsletters. We reserve the right to withdraw this competition at any time. Great company to shop with and all products are of great quality. 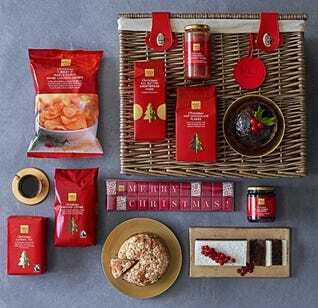 M & S Hampers look so delicious with such a great range of food and snacks for everyone to enjoy, hoping that I may be the lucky one to try this. My dad was delighted with his Comfort socks as they did not restrict circulation and are very comfortable. Love then I got them for a Christmas present and she loves then good fit too. Really enjoy your quizzes, thank you. Best wishes to you all for 2017. Love to win your hamper would be very useful. Thanks for giving us the opportunity to have some Xmas fun. Cosyfeet and M&S Nice combination. Can walk again. Just got my cast off my broken leg. Merry Xmas. Be a great way to start christmas, been recovering from an operation lately so hope to win! Merry Christmas. This hamper looks delicious.